I happened to see a Mrs Mini advert and intrigued I got in touch. This then moved onto a discussion with Tracey on what she does, how she worked and also my requirements. I wasn’t really expecting her to call less than 2 hours later with “I have got one”. Hence from a call on a Monday, I owned a Mini by the Thursday… however I think it can often take a lot longer to find a good one matching your requirements! I was impressed with Tracey’s attention to detail and trying to ensure she sourced an excellent car – basically she cares about your requirements and the car. Also although sourced for you, if you change your mind, she tries to source cars that would sell anyway, so there is a back stop for her. I have had the car a few weeks and each drive brings a smile to my face. Assuming the car continues to be as reliable and good as expected, I would have no quibbles with sourcing another Mini from Tracey and I also plan to use her servicing etc. I bought my Mini Cooper a week ago and i love it! It’s great to drive and everyone has commented on how nice it is. Tracey was a massive help in my decision to get it, she went through everything I needed to know in detail an made sure I was completely satisfied before I bought it. I will definately be recommending Tracey at MRS MINI to anyone that is looking! Thanks Tracey! A first class professional bespoke service. I had looked on line and at several cars at dealers, all of which were rubbish. When Tracey says ‘ immaculate ‘ it means just that. Worth the journey for sure. My Cooper S was a great spec and colour full history the nuts…. Being in the law sector I am a touch cynical about most things and people but I would recommend Mrs Mini to anyone. 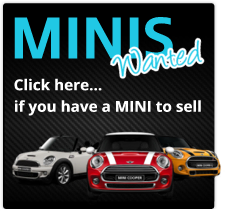 Brilliant site, helped me sell my mini cooper s within 2 days of publishing! Well Done Tracey, and thanks for your advice/help!